The OM-320-PSM-2 Power Supply Module as well as the OM-320, OM-420, OMP-MNL and OMP-MODL Series Data Loggers that it was used with have all been discontinued. Please see the OM-SQ2040 as a possible alternative data logger or contact our DAS Engineering department. The OM-320-PSM-2 Power Supply Module provides excitation power for sensors used with the OM-320, OMP-MNL and OMP-MODL dataloggers. The OM-320-PSM-2 can supply 100 mA of current … sufficient to power up to five 4 to 20 mA loops. Alternatively it can be used as a voltage source for sensor excitation. 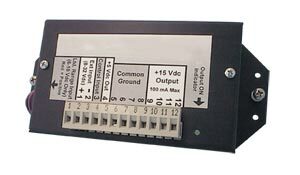 A 5 Vdc output is standard and one additional output is available which can be jumper programmed in the field for 10, 15 or 24 Vdc output. Four standard versions of the OM-320-PSM-2 are available for use with the OM-320, OMP-MNL and OMP-MODL dataloggers or as a stand-alone module. The OM-320-PSM-2 draws its power from the standard datalogger D-cells or an external supply. The OM-320-PSM-2 outputs are cycled ON/OFF by a software controlled low-level 5 Vdc input from the associated datalogger which provides power only as required for sampling and minimizes power consumption and maximizes battery life. An LED indicator lights when the outputs are ON. Sensor excitation is easily programmed into the datalogger via the HyperWare software supplied with the datalogger. Power supply module mounted into OMP-MODL stacking frame for installation into the OMP-MNL or OMP-MODL datalogger stacks. Typically specified if sensor power is desired but the OMP-MNL-BATT (six D-cell battery pack) module is not. Stand-alone portable power supply module including 6 D-cells which can be used to provide sensor and loop excitation and instrument power for other data acquisition equipment. 참고: Power supply modules are supplied with complete operator’s manual.